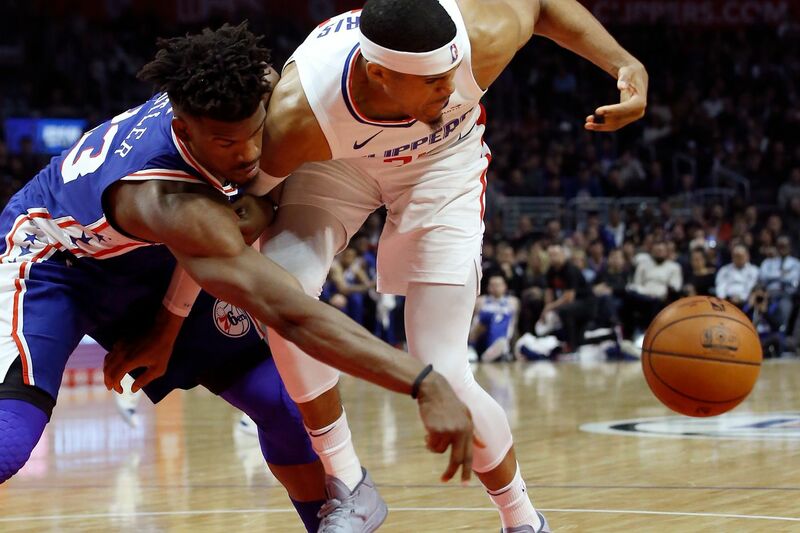 Jimmy Butler (left) battles the Clippers' Tobias Harris during the Sixers' win in Los Angeles on Tuesday. PHOENIX -- The 76ers are without two of their three starting frontcourt players for Wednesday night’s game against the Phoenix Suns at Talking Stick Resort Arena. Swingman Jimmy Butler and power forward Wilson Chandler are both sidelined with upper respiratory infections. Meanwhile, center Joel Embiid was listed questionable with knee soreness before being cleared to play at game time. Embiid finished with 28 points, 19 rebounds and three blocks in Tuesday’s 119-113 victory over the Los Angeles Clippers at the Staples Center on Tuesday night. Butler had 16 points, six rebounds, four assists and one steal before being ejected in the fourth quarter. Meanwhile, Chandler finished with seven points and four rebounds in the victory. Embiid had missed Sunday’s 129-95 loss due to the left knee soreness. The Sixers take a 24-14 record into the contest with the Suns (9-29). This mark their final games of their road trip that began on Christmas night at the Boston Celtics.